An Angel dropped a parcel on my doorstep today. I opened it to find lots of goodies and being the greedy me, immediately opened everything to see. First thing I saw were these Suncoat nail polishes. They caught my eye because they're water-based. 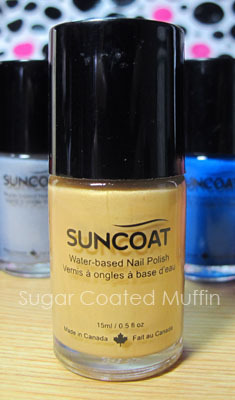 You can read about Suncoat water based nail polishes and their benefits HERE. 04 Berry, 14 Silver, 19 Gold, 22 Peacock Blue, 30 Lavender & 32 Apricot. Upon opening the bottle, I discovered that they didn't have the usual stinky smell and actually smelled like chocolate flavoured protein powder (my bf goes to gym lol). Swatches! Berry's shimmers weren't obvious and it's the creamiest, Silver appeared to have very fine glitters, Gold wasn't quite shimmery, Peacock Blue had beautiful shimmers, Lavender had some kinda duo colour pink-blue thingy going on & Apricot was shimmery yet a little matte. Does that make sense? Lol Click HERE for other shades. Apple 2 to 3 thin coats to clean grease free nails. Dry fully between coats. Apply suncoat Clear Top Coat for an even longer lasting finish. Do not soak nails in very hot water within 8 hours after application. I was kinda disappointed at how streaky this polish was but when it's dry, it's not obvious. Applying many thin coats looked better than one thick coat. Also, do make sure it's dry before reapplying or else you will ruin it. It only takes about 1 minute for it to dry fully. Yay! Here's 2 coats of Apricot. I like the finish! I think it's quite unique ^_^ However, I find it to be too sheer even after 3 coats. You can remove these by just soaking your fingers in hot water for 2 minutes and then scraping it off. I took a shower after 4 hours with luke warm water and it ruined my nails =_= I spent 10 minutes scraping it off (it doesn't come off as easily as I thought but it fades as though the water is corroding it). On my 2nd attempt, I used top coat and it lasted!But of course.. Now I can't remove it with hot water cos my top coat requires nail polish remover. ** Products were provided by Angel. However, this has not affected my thoughts on the product in any way.